Former President Mahinda Rajapaksa says that the campaign to ‘sling mud’ at him has begun and that even foreign countries are now being used to tarnish his reputation. “Now the campaign to sling mud at us has commenced. They are catching me for everything,” he said, adding that someone had even claimed that he was behind State Minister Vijayakala Maheswara’s statement. “Now they are not slinging mud from Sri Lanka, now they are also slinging mud abroad. I don’t care if they sling mud abroad,” he said, speaking during an event held this morning at the SLPP headquarters at Nelum Mawatha, Battaramulla. The former President said that some people are asking him why he is not suing The New York Times over the article which had accused his government of corruption, and that his response is that he does not have a vote in America and he is not going to contest any election in America. However, he said that they have already handed over to initiate legal action a certain organization in Sri Lanka for unnecessarily distorting and publishing the said article. “That is not to suppress the media. It is to correct them,” he stressed. Several SLFP provincial council members obtained SLPP membership today in a ceremony at party headquarters in Nelum Mawatha attended by the former President, former minister Basil Rajapaksa and former Defence Secretary Gotabaya Rajapaksa, who attended the event on a special invitation from the party. 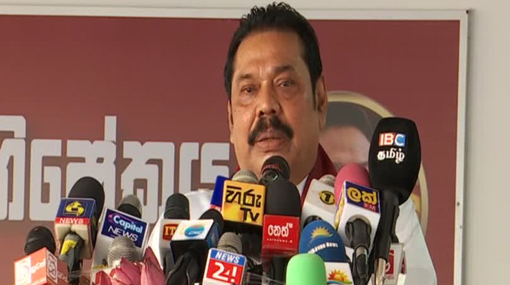 Rajapaksa expressed pleasure for inviting Gotabaya Rajapaksa and his acceptance of the invitation. “There is no Viyath Mawatha. It is only a word for a programme,” he stated, adding that they are both taking forward the ‘Mahinda Chinthanaya’. Former Defence Secretary Gotabaya Rajapaksa, speaking to reporters after the event, said that ‘Viyath Maga’ should be considered as place to pool together resources for any government that comes to power in the future. He said that what they are doing with Viyath Maga is gather scholars who will be good resources for the next government.